The golden glow of late afternoon, the reddish orange of sunset and the pink of dawn's first light, these are the colors of Topaz, a gem with the warm tones of the sun. Like the sun, topaz is flattering to the skin, lighting up your face with a golden glow that enhances every color in your wardrobe. Topaz can be the amber gold of fine cognac or the blushing pink-orange of a peach and all the beautiful warm browns, golds, and oranges in between. Some rare and exceptional Topaz is pale pink to a sherry red. All of these colors are known as precious Topaz. Blue Topaz, a popular affordable gem, has an enhanced color: Topaz with a natural blue color is very rare. The Egyptians said that Topaz gemstone was colored with the golden glow of their mighty sun god “Ra”. This made Topaz a very powerful amulet that protected the faithful against harm. The Romans associated Topaz gemstones with Jupiter, who also is the god of the sun. A Topaz gemstone sometimes has the amber gold of fine cognac or the blush of a peach and all the beautiful warm browns and oranges inbetween. Some rare and exceptional Topazes are pale pink to a sherry red. Wear Topaz gemstones only if you wish to be clear-sighted: As legend has it Topaz dispels all enchantment and helps to improve eyesight as well! The ancient Greeks believed that these gemstones had the power to increase strength and make its wearer invisible in times of emergency. Topaz gemstone was also said to change color in the presence of poisoned food or drink. Its mystical curative powers waxed and waned with the phases of the moon: It was said to cure insomnia, asthma, and hemorrhages. Perhaps the most famous Topaz gemstone is a giant specimen set in the Portuguese Crown, the Braganza, which was first thought to be a Diamond. There is also a beautiful Topaz gemstone set in the Green Vault in Dresden, one of the world's most important gemstone collections. Brown, yellow, orange, sherry, red and pink Topaz gemstones are found in Brazil and Sri Lanka. Another source of Pink Topazes is found in Pakistan and Russia. When pink topaz was first discovered in Russia, ownership was restricted to the Czar and his family and those to who he gave it as a gift. 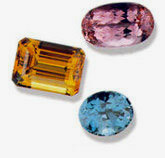 This is why fine colored Topaz is known as Imperial Topaz. Today we also have blue Topaz, which has a pale to medium blue color created by irradiation. Pale Topaz gemstones which are enhanced to become blue is found in Brazil, Sri Lanka, Nigeria, and China. In early 1998, a new type of enhanced Topaz gemstones - Mystic Topazes - made their appearance, the surface-enhanced Topazes, with colors described as blue to greenish-blue, rainbow or emerald green. Topaz gemstones are the birthstones for those born in the month of November. We offer you great different colored Topaz gemstones with best quality at wholesale prices! Check out our online-shop! Buy White Topaz online - Buy Sky Blue Topaz online - Buy Swiss Blue Topaz online!